With the new “focus” parameter, you can effectively define the cross-sectional area of a region of light nearest the light source. Prior to this update, the near side cross-section was always 0 as the nearside light came to a single point. To access this parameter, simply go to the “light cone” menu of your light object, then input a value for “focus”. 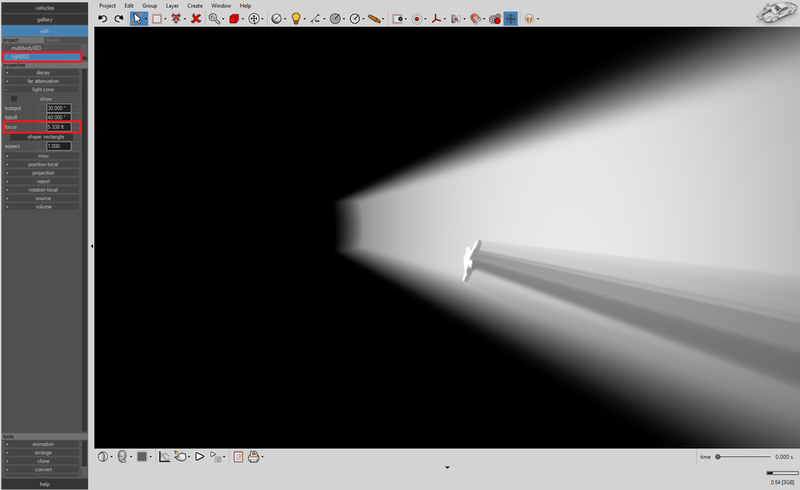 Using the new “projection” option, you can now project your spotlight through custom image files. This works for both the shape:circle and shape:rectangle options. Simply select your light object, then open the “projection” menu, left-click on “file” and select your image file. For the shape:rectangle option, enabling “use texture ratio” will automatically set the “aspect” option to match the aspect ratio of the image file. Using this feature, users can now define their own custom light envelope cross-sectional shapes for spot lights by using projection maps (see for example: SAE 2009-01-0110). Before this update, users were limited to either circular or rectangular cross-sectional areas for spot light objects. Two new preset light types have been defined: “front light right” and “front light left”, both of which use the new focus and projection options. Simply left-click on your light object, go to the “misc” menu, left-click on “presets”, and select “front light right” or “front light left” from the drop down menu. 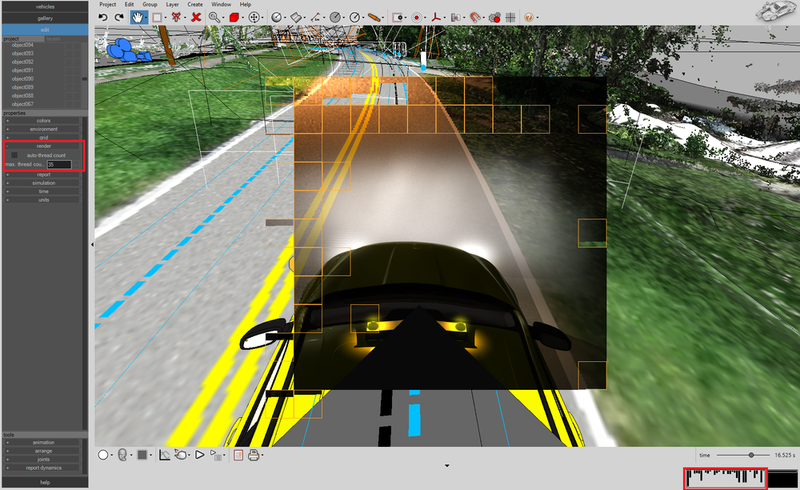 This will load the corresponding sample projection map file found in the shapes/textures/lights folder (not intended to represent any particular headlight). You are free to create your own custom projection map, as well as modify any of the various light parameters as needed for your case. Like any application, Virtual CRASH loads your project’s resources into memory, but there’s a finite limit to how much memory can be used. With the Spring 2019 Software Update, the maximum memory allocation goes from 2 GB to 3 GB, thus increasing the available space by 50%. You should try to keep your total memory usage below 3 GB. As you approach the 3 GB limit, you’ll note the indicator flashing to warn you. Note: projects saved above the 3 GB limit may not reopen correctly. If you create your own custom vehicles, decimate vehicle meshes as much as possible before importing them into Virtual CRASH. Doing so not only improves simulation performance speed, but also cuts down on total memory needed to store your vehicle or object (see: https://www.vcrashusa.com/blog/2016/6/23/beware-of-many-polygons-importing-third-party-vehicles ). Reduce memory allocation for point clouds. If you’re using a point cloud for surface meshing, use the remove points option to clear these points from memory. If you’re setting the camera a few hundred feet above the road surface, it may not be necessary to load 768 MB worth of points for trees and shrubs, as your final rendered animation may look the same if you used one-half or one-quarter the max memory. Use jpg images rather than png or tiff images for textures – especially for orthomosaics. This can make a huge difference in memory usage without making any noticeable difference in video quality. Consider saving, restarting VC4, and reloading your project file occasionally to ensure deleted objects are completely cleared from memory. Always save multiple versions of your projects. With the Spring 2019 Software Update, you’ll be able to set the maximum number of CPU threads to use for rendering. Prior to the update, you were limited to 32 threads. Now you’ll be able to unleash the power of your Threadripper, i9, or whatever hardware you have. You’ll love the time-savings you’ll get with this new feature. Go to the “render” menu in the left-side control panel. You’ll notice the “auto-thread count” option automatically enabled (auto-thread count option maxes out at 32 threads). Disable “auto-thread count”. Next, type in the number of threads you would like to use. Be sure to do a few test renders at the value you enter to make sure your machine is stable during rendering. You’ll see the number of active threads on the bottom right of the application window. System stability can be a function of total memory usage as well as project file size. Remember to save multiple instances of your project as you build it and always save your project before rendering. You’ll likely notice memory usage spike during rendering. This is normal. Look in the “material” drop-down in the “faces” menu for the mirror shader. With this shader, you can now more easily visualize the view off of reflective surfaces such as rear-view mirrors and side-view mirrors. Setting polygon shader types is reviewed in Chapter 7 of the User’s Guide.